Sold Out. The #1 New York Times bestselling author and firebrand syndicated columnist Michelle Malkin sets her sights on the corrupt businessmen, politicians, and lobbyists flooding our borders and selling out Americaâ€™s best and brightest workers. 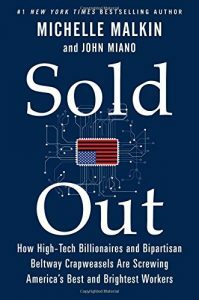 In this book, Malkin and Programmers Guild founder John Miano name names and expose the lies of those who pretend to champion the middle class, while aiding and abetting massive layoffs of highly skilled American workers in favor of cheap foreign labor. Finally, the Programmers Guild assists the growing numbers in our profession who are unemployed. The right to practice in one’s chosen profession is a Constitutional liberty [Gibson v. Berryhill, 411 U.S. 564, 571 (1973)] that is violated by visas that force Americans to train their foreign replacements or otherwise result in displacement by foreign workers.